The New York Times bestselling author of An Early Wake returns to Ireland where Sullivan’s Pub owner Maura Donovan gets mixed up with smugglers. After calling Ireland home for six months, Boston expat Maura Donovan still has a lot to learn about Irish ways—and Sullivan’s Pub is her classroom. Maura didn’t only inherit a business, she inherited a tight-knit community. And when a tragedy strikes, it’s the talk of the pub. A local farmer, out for a stroll on the beach with his young son, has mysteriously disappeared. Did he drown? Kill himself? The child can say only that he saw a boat. 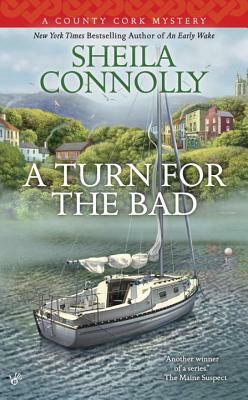 Sheila Connolly is the New York Times bestselling author and Agatha Award-nominated writer of the Museum Mysteries, the Orchard Mysteries, and the County Cork Mysteries. She has taught art history, structured and marketed municipal bonds for major cities, worked as a staff member on two statewide political campaigns, and served as a fundraiser for several nonprofit organizations. She also managed her own consulting company, providing genealogical research services. In addition to genealogy, Sheila loves restoring old houses, visiting cemeteries, and traveling. Now a full-time writer, she thinks writing mysteries is a lot more fun than any of her previous occupations. She is married and has one daughter and three cats.